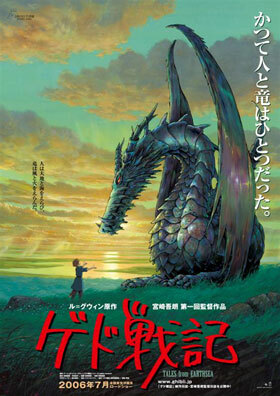  This story is legendary, but we'll repeat it anyway: reportedly, original Earthsea author Ursula K. Le Guin granted Studio Ghibli the rights to Earthsea with the understanding that it would by Hayao and not Goro Miyazaki who would helm the film. Her disappointment is likely shared with many audiences.  More scuttlebutt: Hayao Miyazaki was against his son Goro directing Tales from Earthsea, but the board at Ghibli backed Goro. Also, it's been reported that Hayao Miyazaki was not the most attentive father, which Goro apparently resented while growing up. Interestingly, Tales from Earthsea opens with a sequence where the hero murders his own father.  Ursula K. Le Guin's opinion of Tales from Earthsea can be found here. We have no idea where Hayao Miyazaki's public opinion of the film can be found.  Thanks to the licensing deal that allowed the Sci-Fi Channel to create their 2004 TV miniseries Earthsea, there is an embargo on any Earthsea adaptation in North America until the year 2009. As such, a potential Disney version of Tales from Earthsea (Disney has a licensing deal with Studio Ghibli, e.g. Spirited Away and Princess Mononoke) won't be showing up anytime soon. For once Disney isn't the one who messed this one up. The Skinny: Interesting and certainly watchable, but disappointing by Studio Ghibli's sky-high standards. Goro Miyazaki has a long way to go to fill his father's shoes. However, Tales from Earthsea is presumably still better than the Sci-fi Channel miniseries. Check your Miyazakis. It's not Hayao Miyazaki who directs the new Ghibli film Tales From Earthsea, but Goro Miyazaki, the legendary director's son who takes the directorial reins. Based on the long-running fantasy novel series from author Ursula K. Le Guin, the film takes place in a fantasy world that thrives off an unseen force called "the Balance". The film kicks off with the sighting of feuding dragons in the eastern sea - an unheard of occurrence as dragons are known to dwell in the west, and don't usually hang out in man's world. What this tells the local populace is that things are not so well with the Balance. You see, as Earthsea lore tells us, the Balance is upset when necromancy is being practiced. Basically, dragons in the east sea = a disturbance of the Balance = bad wizardry happening somewhere. Thanks to these inauspicious circumstances, the world is now headed to rot, with droughts, unhappy livestock, and yes, angry people afoot. The angry people are embodied by young Prince Arren, who first appears when he stabs and kills his own father, who happens to be the King, before fleeing into exile. Arren eventually hooks up with benevolent wizard Ged, who's looking to stop the world from going completely to Hell. He's seeking the source of the evil magic, and takes Arren under his wing because he recognizes that Arren is haunted by a dark "shadow". After some shenanigans with a mysterious girl named Therru, Arren settles in with Ged's old friend Tenar, and helps to run her farm. But the darkness still creeps inside Arren, leading him to flee alone, abandoning his new friends. Ged eventually discovers that the party responsible for Earthsea's ills is an evil wizard named Cob, an old adversary who seeks immortality, and isn't above trashing Earthsea to gain it. Cob has been opening a doorway between the living and dead worlds, an action that has upset the Balance and could lead to Earthsea's ruin. To further his nefarious goals, Cob attempts to use Arren to kill Ged, but Arren's complicity depends entirely on his ability to combat his own inner darkness. Will he succeed, attain righteousness, and wield his father's glowing magic sword against Cob? Or will he succumb to the darkness, allowing Cob to kill his friends, attain immortality, and generally make a mess of the world? Well, we won't give it away, but since Tales From Earthsea is loosely based on only the third novel in Earthsea series, you can probably figure out the answer yourself. A harder question to answer is: is Tales from Earthsea any good? If an expert opinion is to be believed, then the answer is "no"; Ursula K. Le Guin has candidly related that she finds Goro Miyazaki's Earthsea to be not as good as her source material, and also not as good as the work of his father Hayao. Frankly, her opinion is easy to agree with. While the film is obviously quite beautiful to look at, and possesses character designs and backgrounds as beautiful as anything ever produced by Studio Ghibli, the film ultimately feels quite cold and routine. Earthsea is a deep fantasy world with a rich history, but the film doesn't get that across. Much of Earthsea's details are related in exposition; the audience is simply told the culture and history of Earthsea instead of actually experiencing it themselves. One of Hayao Miyazaki's undeniable strengths is his ability to use small details to bring a richness and life to his animated world, drawing audiences in through image and sound rather than a bunch of dialogue. However, Goro Miyazaki doesn't seem to possess those powers yet. Furthermore, the film is saddled with a difficult protagonist. Arren is hard to really like, as his weakness, anger, and cowardice make him rather unappealing. His violent rage is revealed early on to be the result of a supernatural darkness that haunts him, but the film doesn't develop him enough to make him more than a nominal hero. The audience may find some identification in the familiar-looking characters and images, and the film's grand mythic themes - darkness vs. light, good vs. evil, etc. - are easily understood. However, if the themes feel compelling at all, it's because they're so familiar, having played out in more fantasy mediums (novels, films, games, etc.) than one could mention in a small space.